It's here. This is the first Ferrari branded Hublot timepiece to come out of the two brand's joint partnership. 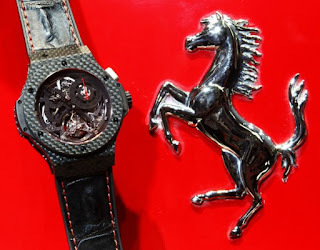 Unveiled in China, the watch called the Hublot Big Bang Chrono Tourbillon Ferrari is meant to celebrate the quizzically celebration-worthy 20th anniversary of the first Ferrari car sold in China. I don't even think the dealerships there knew about that. Limited to just 20 pieces the watch (ref. 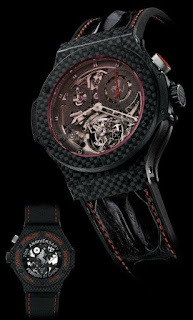 308.QX.1110.HR.SCF11) will be offered in a 44mm wide all carbon fiber case with red tinted sapphire crystal. See the Ferrari logo as part of the chronograph subdial. The movement is the Hublot caliber 6300 column-wheel chronograph with tourbillon and power reserve. You can see the full tech specs below. Hublot considers this as a bit of a preview for a larger Ferrari watch collection from the brand that will debut at Baselworld 2012. Clasp Big Bang micro-blasted black PVD titanium deployant buckle, micro-blasted black PVD titanium cap, micro-blasted black ceramic decorative plate, black ink engraving and polished black PVD screws.